After Hernandez's death, the families of Daniel de Abreu and Safiro Furtado said they would continue to pursue their wrongful death claims against Hernandez's estate. BOSTON (AP) _ A judge says two wrongful death lawsuits pending against the estate of late NFL player late Aaron Hernandez will be heard in Boston. An attorney for Hernandez's estate asked that the suits filed by the families of Daniel de Abreu and Safiro Furtado be tried in Bristol County, where the attorney's office is and a third wrongful death suit is being heard. A judge in a decision released Wednesday said Boston is the proper venue because that's where the families live and an impartial jury can be seated. A judge says two wrongful death lawsuits pending against the estate of late NFL player late Aaron Hernandez will be heard in Boston. A judge says two wrongful death lawsuits pending against the estate of late NFL player Aaron Hernandez will be heard in Boston. Furtado and de Abreu were killed in a Boston drive-by in 2012. 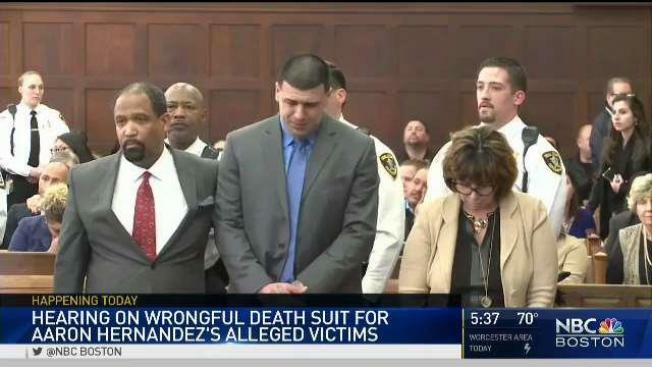 Hernandez was acquitted of the killings in April. Days later, he hanged himself in his prison cell, where he was serving a life sentence for the 2013 killing of Odin Lloyd.